What happens when you face network outage? No need to explain – the effect will be catastrophic as everything gets affected. Your employees will not be able to do their work; customers will not be able access your services and in extreme cases, entire business activities come to a halt. The ‘after-effects’ of the outage could be more worse – might have a rippling effect on the revenue stream and even loss of trust and credibility could occur. Network outages could occur due to a variety of reasons. But, industry experts have reported that more than 60 per cent of the outages occur due to human errors committed when carrying out device configuration changes. Enterprises make huge investments on procuring network infrastructure and employ highly skilled professionals to manage and administer the network infrastructure. Typically, a few administrators manage a large infrastructure. Business needs are in a constant state of flux and administrators are required to respond to the needs often by changing the configurations of network devices, which is a sensitive and time-consuming task. It requires specialized knowledge, familiarity with all types of devices from different vendors, awareness on the impact of changes, precision and accuracy. Manual operations to carry out configuration changes are fraught with the risk of errors that result in network downtime. In addition, a trivial error in a a configuration could have devastating effect on network security giving room for hackers and malicious users. When the number of devices grows, administrators find it difficult to respond to the business priorities that require frequent configuration changes. Possibilities of committing errors become bright. Due to the haphazard way of carrying out changes to live equipment without any management plan, when errors in configuration cause network outage, administrators end up wishing that they could move the configuration back to a proper working version. They manually troubleshoot the cause, which often proves herculean. 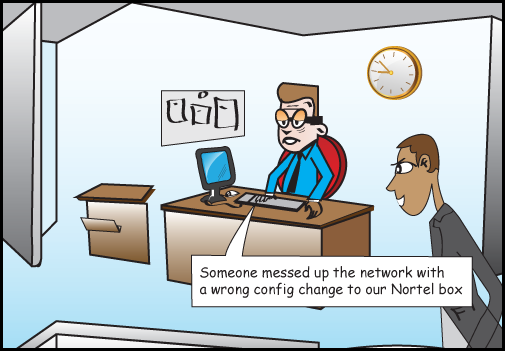 Changes need not be the enemy of network availability! Configuration changes are inevitable in enterprise networks. By replacing manual processes with an automated approach, administrators can overcome all the risks explained above. Network Change and Configuration Management (NCCM) solutions help you reduce human errors and thereby network downtime and security issues. ManageEngine DeviceExpert, a trusted NCCM solution helps you maintain versions of device configurations in a secure, centralized repository and manage them from a single interface. You can take backup of device configurations, view them, edit them in config editor and upload changes to the device. If the device goes down due to erroneous config change, you can immediately get the device up and running by deploying the previous configuration. Troubleshooting also becomes easier as you can find out the errors by looking at the configuration difference. See how DeviceExpert helps in effectively managing device configurations!